As the leader at New America for nearly four years, my staff, our work and our mission are my priorities. I am completely committed to the intellectual independence and integrity of our work; it is the foundation of our reputation. I have racked my brain for the last two months, and certainly over the last two days, as to what I, in consultation with my leadership team, could or should have done differently about the departure of Barry Lynn and Open Markets from New America. At its core, this was a personnel issue that I knew others would see as a program issue. The way I saw it, I had three choices: I could keep an employee who had repeatedly violated the standards of honesty and good faith with his colleagues, including misleading me directly. I could fire him outright and try to find a leader for his program, which would force both his funders and his program staff, many of whom were young rising stars who both Barry and I have mentored, to choose between us and him. Or I could try to work with Barry to negotiate a cooperative spinning out of the Open Markets program, as we have done with a number of other programs. I chose the third option, one that was much better for Barry than an outright firing would have been. We have spent the last two months negotiating an exit agreement in good faith, contacting the program funders about the transfer of funds to what Barry described as the independent “Open Markets Institute,” and ensuring that his staff would have a smooth transition. This was no “expulsion” of his team; quite the contrary, our biggest concern was precisely that these were New America employees to whom we had real obligations and regretted losing. 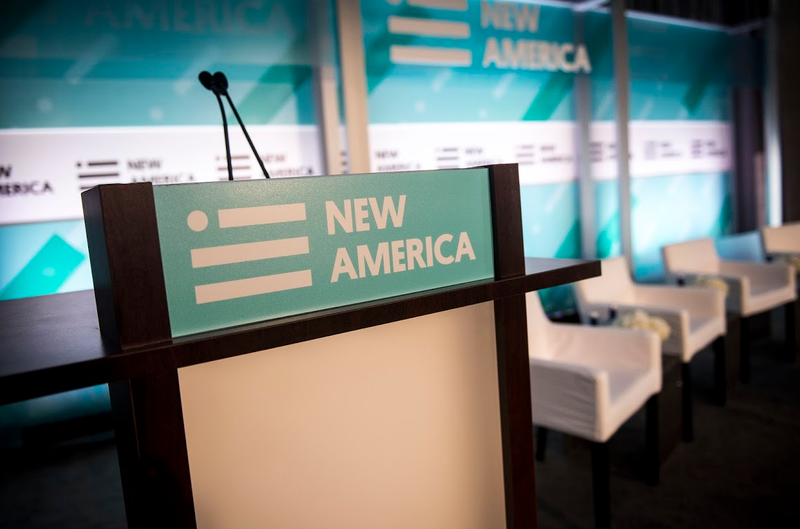 Moreover, we had prepared a statement announcing the spin-out that emphasized our respect for Open Markets’ work, which New America has incubated and supported for almost a decade. Work that has included plenty of attacks on corporations that have funded other parts of New America. We were having productive conversations with Barry as recently as Monday. I write today, however, not to restate New America’s position, which you can find here and here, but to look at the deeper tensions that anyone must face who tries to run an institution committed to intellectual independence, public debate, and a genuine diversity of views but who must also actually raise the funds to support that institution. New America was founded in 1999 in part to address the public problems that would be created by the massive disruption of the Digital Age, as one of our founders, Michael Lind, wrote about very clearly back in the 1990s. Much of New America’s early money came from Silicon Valley. James Fallows, who was way ahead of many of his journalistic peers in covering tech, was our first board chair. He had become friends with Eric Schmidt when Eric was still at Novell and recruited him onto our board. Eric then went to Google and later became our board chair. He had been a personal friend of mine from other circles; he played an important role in convincing me to take the CEO job at New America. He has been very generous to New America and we are proud of our association with him, regardless of changing political fashions. Google and many other tech companies have also provided funding over two decades, supporting a lot of terrific work on issues that are absolutely central to the kind of country we will be in an age in which we live and work and shop online as much as we do in the physical world. At the same time, we have bragged from the beginning, using various adjectives, that we are an independent, heterodox, iconoclastic place. Barry Lynn and Michael Lind have long argued about economic concentration; a year ago we held a debate between Barry and Michael for our staff on Hamiltonian versus Jeffersonian views of the economy. In the coming months, one of our programs is hosting several events about the dangers of monopolies. I am no stranger to situations in which a fellow or a program staff member writes something that directly contradicts the views of another program in ways that has upset a funder. It has happened a number of times in the education space, where funders and researchers have very strong views; in cybersecurity and privacy, where some of our international security experts have quite different views than the privacy champions of our Open Technology Institute do on what are legitimate security measures. In the academy, where I spent the first 20 years of my career, the answer is simple. The university pays the salaries of professors. Donors know that academic independence is sacrosanct, even though they routinely fund new centers advancing subjects or even sets of views that they are partial to. As a nonpartisan think tank, one that prides itself on not being politically predictable, we uphold the same standards of intellectual independence. But we do not pay our researchers’ salaries. Grants do — from foundations, individuals, and, increasingly, as the funding space gets tighter and tighter, corporations. We tell all of our donors that they cannot control the results of what they fund; we do not do contract research. But we also develop and maintain relationships with our donors as does any nonprofit institution. So there’s the tension. In practice, with an employee who had already surprised his colleagues unpleasantly — and many would say dishonestly — in the past, it meant that I wanted to see a press release before it went out. That is the reason that the Open Markets statement went up and then was taken down. It was posted before I had a chance to give it a final review. Indeed, I was talking to Barry about it on the phone when it went up. I have never — nor would I ever — censor anything, but I might ask questions about accuracy or tone. And, in this case, I wanted to give the funder a heads up that it was coming and send it over ourselves. That seems like a defensible minimum courtesy that an institution can offer its funders: we’re about to do something you are really not going to like, but at least we are telling you about it. I recognize that the best journalists operate on a different principle — notice seems to imply interference. But we are not a newspaper, yet we try to uphold the best journalistic standards in our writing. Going forward, these are the kinds of issues that we at New America will be engaging deeply and explicitly, asking ourselves how precisely we need to spell out the norms of what kind of behavior program directors can expect from other program directors — all of whom work hard to raise funds and maintain good, honest, and transparent relationships with donors — and what kinds of commitments we can make to our donors about notice and even right of response. It is also fundamentally about what kind of institution we want to be. We are not a university; we believe that we are a community of colleagues. We have a social compact and a special New America way of doing and being. How do those things factor in? I had to make a tough call. I still believe I made the right one consistent with our history and institutional values. However, I have also been reflecting on the choices we made in the rush of a big story that suddenly revealed that we were not in fact negotiating a cooperative spin-out with Barry Lynn but were in fact on the other end of a carefully prepared campaign, one that was already generating thousands of tweets and emails. In an effort to express New America’s position quickly in 140 characters, I said that Ken Vogel’s New York Times story was false. The heart of my disagreement with the New York Times story is a passage that strongly implies a timeline where Eric Schmidt contacted us before we took Barry Lynn’s statement criticizing Google offline, implying causality. That timeline is wrong. More broadly, many of the story’s facts and selective quotations were presented in a way that gave the strong impression that we told Open Markets it had to leave because of pressure from Google. Again, this is simply not true. Still, the blanket claim that the entire story was “false” contributes to the kind of degradation of our national discourse that I often publicly lament. New America tries to uphold the best journalistic traditions, including verbal precision backed by evidence. At a time when it is critical to uphold the integrity of the news media, I regret my tweet. It’s been a challenging week for everyone at New America. Nothing we say is going to convince the many people who want to believe a David versus Goliath story of Barry Lynn versus big bad Google. On the contrary, Barry’s new organization and campaign against Google is the opening salvo of one group of Democrats versus another group of Democrats in the run-up to the 2020 election, at a time when I personally think the country faces far greater challenges of racism, violence, a broken political system, and geographic and partisan divisions so great that we are losing any common sense of what we stand and strive for as a country. Assuring an open and competitive digital economy is a critically important issue, one that New America will continue to work on. We will continue to work on issues of education, work and family, national security, political reform, the future of work, and how to take advantages of the opportunities of digital technology directly by putting engineers side-by-side with policymakers. We will continually reflect on how best to reconcile the differences and tensions inherent in our work, while insisting on both intellectual independence and norms of honesty and good faith in our relationships with one another. But for us, organizations like us, and the media who cover us, let’s start by speaking truth, even when it’s complicated and messy and hard.